Support Stonehill students and strengthen the experiences and opportunities offered to them. Philanthropy is a wonderful way to show your commitment to, and support of the College. Make a gift today that supports the initiatives that mean the most to you. Faculty and Staff giving is about investing in the community you all already strengthen on a daily basis through the hard work you do. By giving back, whether it is to the Stonehill College Fund, or a specific designation, you make Stonehill that much stronger. Your gift could mean more aid awarded from a scholarship, more resources for a group of students traveling abroad or with a H.O.P.E trip, more materials for a SURE project, or just overall a better experience for our students. Programs like the Bridge Fund help us to assist more students and their families to meet unexpected financial demands and fulfill their goal of a Stonehill education. Student Opportunity Awards, which are funds made available through the generous support of donors to the College, are available to students in order to subsidize the costs associated with their participation in a wide range of high-impact learning activities. A quality collegiate athletic program has always relied upon successful collaboration to achieve goals. Through the hard work and dedication of our student-athletes and coaches and the generosity of our donors, Stonehill’s athletics program continues to produce incredible results. For more information on participating in the Community Campaign, contact Lisa Richards '99 in the Office of Development at (508) 565-1085 or e-mail at lrichards@stonehill.edu. To make your gift through payroll deduction, please complete this form and return to Lisa Richards '99 in the Office of Development. For recurring gifts please make sure to designate a start and end date for your gift. You can pledge your gift up to 5 years! 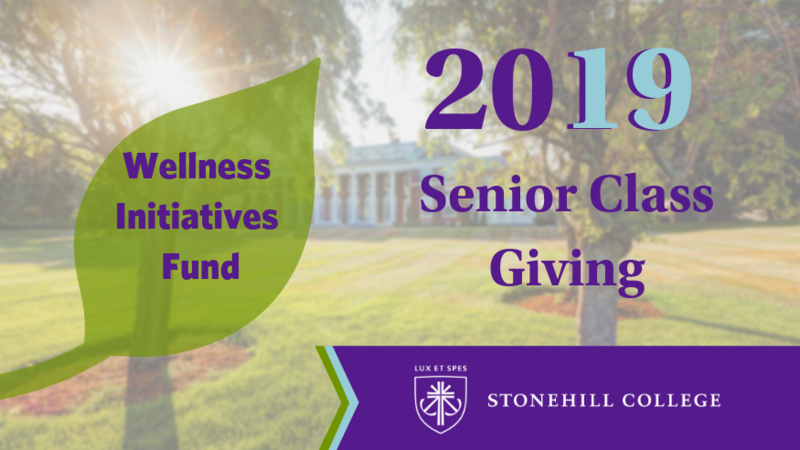 To make a gift to Stonehill College, please choose from the options below. Thank you in advance for your generosity to Stonehill. Make checks payable to Stonehill College and mail to Stonehill College, Office of Development, 320 Washington Street, Easton, MA 02357-6242. You can support the Class of 2019’s Senior Class Gift campaign if you would like to designate your contribution to the Wellness Initiatives Fund. With the generous support of alums, the College has created a Wellness Initiatives Fund, which provides financial support to various student wellness programs, trainings, and events. Student groups, faculty, and staff are encouraged to apply for these funds to either develop new and innovative wellness initiatives or enhance current program offerings. To support the senior class gift through payroll deduction, please use the payroll deduction form above. Your donation may be eligible for a matching gift from your employer. Some companies also match charitable contributions made by spouses, retirees and board members. By taking advantage of your company’s matching gift, your gift to Stonehill could be doubled or even tripled! A donor-advised fund (DAF) is a type of giving program that allows you to combine the most favorable tax benefits with the flexibility to support your favorite charities. DAF Direct enables you to recommend grants to Stonehill College.